Fighting Colds and Flu - Next time you feel yourself coming down with a cold; itchy ears and sore throat etc, don't reach for the Lemsip, reach for 3% Hydrogen Peroxide! Hydrogen Peroxide can be applied to the ear - yes the ear! It sounds strange but this is because the ear, nose and throat are all connected and thus, affected by viruses alike. Administrating 2 - 3 drops of Hydrogen Peroxide into the ears regularly when you feel the onset of a cold or flu will undoubtedly help prevent the onset or at least reduce the duration. Teeth Whitening - Want that Hollywood smile? There is no need to shell out on the latest tooth whitening cosmetics. 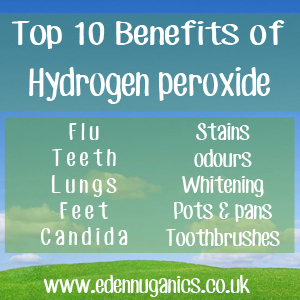 The simple action of swilling Hydrogen Peroxide is known to dramatically brighten a smile in a matter of weeks. H2O2 can also be combined with baking soda to make a home-made teeth whitening toothpaste that costs pennies. Combating Bacterial and Viral Respiratory Diseases - There are many people who claim to have benefited greatly from the use of H2O2 when suffering from respiratory disorders, whether the common cold or a respiratory chest infection. One of the most effective treatments involves inhaling 3% food grade Hydrogen Peroxide from a fine mist sprayer. DO NOT spray up the nose. See the video link below. Treatment of Athlete's Foot - Another popular use for Hydrogen Peroxide is as a treatment for one of the most common and aggravating foot conditions... Athlete's Foot. Simply spray your feet with H2O2 after exercise to remove the unwanted bacteria. For people already suffering from Athlete's Foot, a warm foot-soak of 3% Hydrogen Peroxide can be prepared to help speed up recovery. Treating Candida - Candidia is an infection caused by a group of yeasts that cause an array of problems within the body. As it happens these yeasts find it hard to survive in an oxygen rich environment making H2O2 the perfect substance for keeping Candida in check. Stain Removal - Hydrogen Peroxide is renowned for its powerful stain removing abilities. Whether dealing with melted chocolate or grass stains. H2O2 can help to remove even the toughest of stains. Be sure not use concentrations of 15% or above as this might bleach clothing. Neutralising Odours - No one likes to live with lingering odours. Luckily this is another problem that can be easily tackled with the use of Hydrogen Peroxide. Simply add some 3% H2O2 and a couple of drops of essential oil to a fine mist bottle and spray over the item in question. Fabric Whitening - This one simple tip will save you money from your weekly shopping bill. The active ingredient in most fabric whitening products is in fact Hydrogen Peroxide. They simply dress it in a fancy packet, add a scent and sell it for 10 times the price. Adding H2O2 directly to your washing machine will offer the same benefits for a fraction of the cost. Hard to Clean Pots and Pans - Tired of spending hours scrubbing, trying to shift grime from kitchen pots and pans? High concentration Hydrogen Peroxide can lift grease and grime from the surface of metal making it sparkle like new. Allow your pans to soak for around two hours for the most effective results. Use gloves with high concentrations of Hydrogen Peroxide. Cleaning Toothbrushes - Leaving our toothbrushes in the bathroom can expose them to many forms of bacteria that can take up residence on your toothbrush. Ingesting a few germs is, of course, not a bad thing but it's a good idea to clean your toothbrush from time to time. Soaking the toothbrush in a Hydrogen Peroxide solution, as often as desired, will immediately remove unwanted pathogens as they cannot survive in the oxygen rich environment Hydrogen Peroxide creates.